Organic Joe is Philip Cappadona and Sharyn Dickeson. With only an acoustic guitar, ukuleles, tin whistle, harmonica and percussion they create an engaging musical experience for audiences at Festivals and events throughout Australia. Their sound is strong, energetic and vital. 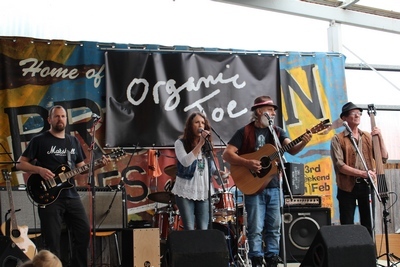 From their quirky, whimsical and satirical originals to unique arrangements of songs from the rich heritage of cross genre music, Organic Joe have proven themselves to be one of East Gippsland’s most endearing and original acts since they formed in 2015. Their musical style is a fusion of contemporary folk, rock, blues and roots, with earthy vocals and velvet harmonies, but it is their original compositions and musical soundscapes which are the real gems. Join them for a performance of songs, fabulous music and cheeky stories!